Cats are truly special gifts. They brighten our lives, complete our households, and keep us smiling with their cute quirks. Our feline friends are definitely something to celebrate! There are now quite a few unofficial kitty holidays, and there’s a great one coming up. February 20th is Love Your Pet Day! Read on as a Mt. Pleasant, SC vet offers some suggestions on pampering Fluffy on her special day. One surefire way to make your furry pal’s day special is to give her a special treat. Canned tuna or chicken in water is a good bet. Fluffy can also have some plain, cooked meat, fish, or chicken with the bones, skin, and fat removed. When it comes to spoiling kitties, toys are definitely at or near the top of the list. You can opt for classic playthings, like little balls or feather toys. Or, try something newer, like a mechanical mouse or an automated laser pointer. We also recommend taking a few minutes to play with your cat. Many of our feline buddies spend quite a bit of time looking out windows. Buy or make Fluffy a comfy window seat, so she can relax, watch birds and squirrels, and daydreaming about hunting. Instant happy cat! While many plants are toxic to kitties, cat grass—or wheat grass, as it is also known—is purrfectly safe for them. You can get your furry buddy a small container of it, or plant some seeds in a shallow tote or old litterbox. When it’s grown in, your cat will have her own little ‘yard’ where she can soak up some sun. Catnip will most likely always be Fluffy’s favorite plant. You can give your feline pal a catnip toy, or offer her a small plant of fresh catnip to nibble on. Or, if you want to try something really cute, offer Fluffy catnip bubbles. Did you know that you can download apps for Fluffy to play on your phone or tablet? Some kitties love ‘catching’ digital mice and birds. At the end of the day, the best way to make Fluffy happy is to make her feel loved. 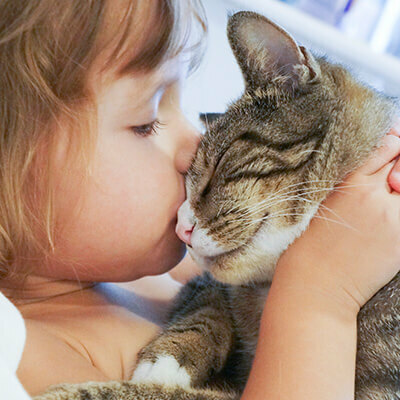 Spend some time with your kitty! Please reach out to us, your local Mt. Pleasant, SC vet clinic, anytime. We are here to help!